The apartment is very spacious. The location is great. It was In a great location easy walk to waterfront and railway station. Plenty of good restaurants close by and very central for shopping. Apartment had everything g we needed and more. Staff were very helpful and friendly and gave us useful information and directions. The location was excellent. Rooms were well maintained and decorated. Perfectly clean. The staff were courteous. It was an excellent experience. Proximity to everything, easy to find location and very clean. Clean and tidy, excellent service, peaceful and in the heart of the city centre. Great location, easy check in, the most comfortable bed I've ever slept in! Got upgrade to an apartment with a fantastic view(thanks again:)) kitchen had everything we needed for a great stay. Ps sorry about breaking a wine glass! excellent location and large living space everything necessary is included. Great breakfast (not included), very central location, very comfortable bed (if you like soft mattresses), very friendly and helpful staff. Lock in a great price for Ole Bull Hotel & Apartments - rated 8.1 by recent guests. One of our top picks in Bergen.This property is 200 yards from the National Theatre and around the corner from Bergen’s lively main square, Torgallmenningen. It offers stylish accommodation with free WiFi and modern kitchen facilities. All accommodation options at Ole Bull Hotel & Apartments have a dining/seating area and cable TV. Kitchens are equipped with a dishwasher, refrigerator and microwave. Bergen Fish Market and the 14-century Bryggen district are 10 minutes’ walk from Ole Bull Hotel. Sightseeing tours can be arranged at the hotel’s front desk. Ole Bull Hotel & Apartments has been welcoming Booking.com guests since 10 Sept 2007. When would you like to stay at Ole Bull Hotel & Apartments? Includes a cable TV, dining table and a fully equipped kitchen. Please note that the beds are only 75 cm wide. Spacious room with separate bedroom and living room. Very spacious top-floor apartment with spectacular views of Bergen city centre. 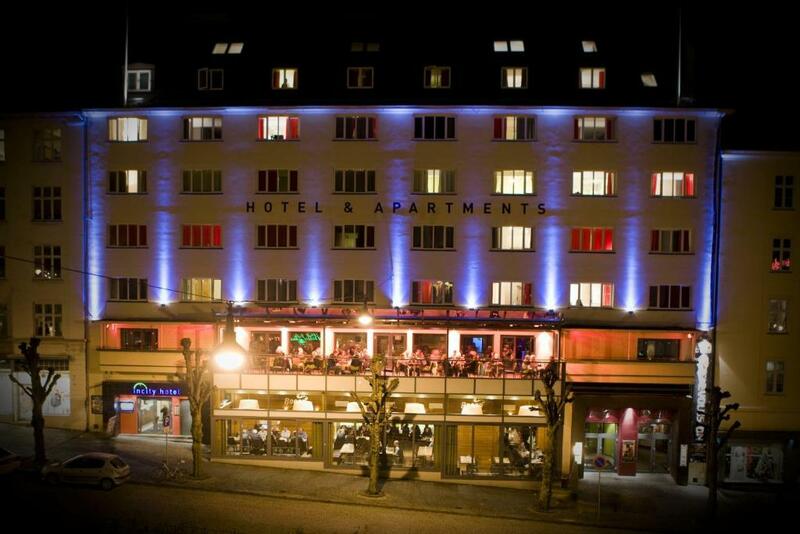 Ole Bull Hotel & Apartments has 60 apartments in the heart of Bergen, right at the main square. The rooms are spacious from 27-75 square meter. All apartments have a sleeping-area ( some 2 bed rooms), livingroom, fully equipped kitchen and bathroom. We do not serve breakfast and the opening hours of the reception is limited to check in and check out. Opening hours for the reception is 09.00 - 17.00 every day. If you need a place to feel at home on your journey, Ole Bull Hotel & Apartments offers you your own bedroom, livingroom and a kitchen where you can cook what ever you want to eat, and the space you need to work. Your home in Bergen, Ole Bull Hotel & Apartments. The hotel is unfortunately not suitable for Wheelchairs. Ole Bull Hotel & Apartments does not accept cash as payment, only creditcards. Property surroundings – This neighbourhood is a great choice for travellers interested in scenery, fish markets and seafood – Check location Excellent location - show map Guests loved walking around the neighbourhood! House rules Ole Bull Hotel & Apartments takes special requests - add in the next step! Ole Bull Hotel &amp; Apartments accepts these cards and reserves the right to temporarily hold an amount prior to arrival. Ole Bull Hotel & Apartments accepts these cards and reserves the right to temporarily hold an amount prior to arrival. If you expect to arrive outside check-in hours, please inform Ole Bull Hotel & Apartments in advance in order to receive check-in instructions via SMS. Guests under the age of 23 can only check in if travelling as part of a family or with an older adult. Please inform Ole Bull Hotel & Apartments in advance of your expected arrival time. You can use the Special Requests box when booking, or contact the property directly with the contact details provided in your confirmation. Kitchenette facilities lacking items. No racks inside oven. Not what one expects if there is an oven supposedly for client use. The apartment was very spacious and well equipped. Very comfortable. The single beds were very narrow and not a lot of space but they were quite comfortable. Could have used an extra pillow. It doesn't have microwave and toaster which I think is essential in an apartment.